TND – The Perfect Food? I firmly believe that sandwiches are the world’s perfect food. You can eat them for any meal of the day. They can be sweet or savory. They can be hand held or served on a plate and require a knife and fork to eat. They can embody the spirit of any culture and cuisine. Plus, by definition they contain a tasty starch. There is no bad in this equation. The British understand the appeal of sandwiches (and bacon) on such a deep emotional level that students at Leeds University got funding to research and derive a scientific formula for making the perfect bacon buttie. How much do you wish you could have been a part of that research team? where N=force in Newtons required to break the cooked bacon, fb=function of the bacon type, fc=function of the condiment/filling effect, Ts=serving temperature, tc=cooking time, ta=time or duration of application of condiment/filling, cm=cooking method, C=Newtons required to break uncooked bacon. Further explanation in layman’s terms can be found at the BBC. I like sandwiches when you call them rotis and they come stuffed with spiced tandoori chicken and topped with tamarind chutney. I like them when you call them breakfast and they come with eggs and cheese. I particularly like them when you call them gyros and they come with yogurt and chili sauces and the grilled meat juices soak into the pita bread. Sandwiches are also the perfect place to get all fusiony with your ingredients. The Banh Mi is at this point considered a quintessential Vietnamese street food, but it originated in the fusion of Vietnamese and French cuisine. This makes it possibly one of the only results of colonization that nobody feels the need to argue was a bad thing. Then the Banh Mi came back to the West on food trucks in California, picked up some further fusion flair, and became the new darling of the food world. I’ve never actually had one – although apparently there is a food truck in Boston that’s serving them – so I can’t tell you whether what I created is authentic to either Vietnam or California. I can say, however, that it was a very tasty sandwich, which in the end is really all I require. Next week Dinner will be on hiatus as 5/8ths of the East Coast version of Dinner + 1/nth of the West Coast version of Dinner (which is to say, Jes) will be applying themselves to the serious task of eating their way through the city of New Orleans. We’ll be back the week after, probably trying to detox after a week of beignets, po boys, jambalaya, red beans & rice and gumbo. This is one of those meals that in retrospect I wonder what on earth I was thinking when I planned it. Who designs a menu where everything has to be julienned? Don’t get me wrong, everything was delicious but it was ridiculously labor intensive as witnessed by the fact that it took me 2.5 hours of prep time on Monday night and filled my fridge with eleven separate tupperware containers plus a sheet pan of meatballs. On the other hand, all the advanced prep on Monday night paid off on Tuesday when all I had to do was dump the contents of the appropriate tupperware containers together and mix. The closest I got to cooking on Tuesday night was mincing some mint, slicing watermelon and throwing a pan of meatballs in the oven to bake. 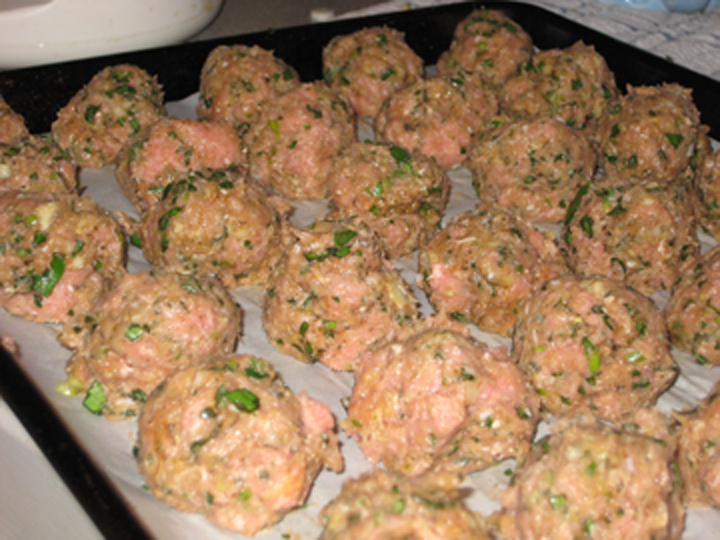 The original recipe is for pork meatballs and calls for ground pork. I was going to use half pork and half turkey, however as it turned out I couldn’t find any ground pork and didn’t feel like trekking down to Whole Foods to see if they had any, so I used all ground turkey. I’m sure it’s a little richer with all or part ground pork, but there’s so much flavor going on here anyway that I don’t know that I really missed it. Mix all the ingredients together in a bowl. Season to taste with salt. Chill. Can be made a day in advance. Note: Unless you’re really into mayo, if you’re doubling the recipe you don’t need to double the sauce. I made 1 cup of mayo and had probably half of that leftover, next time I’ll just make the 2/3 cup for up to 3x the recipe. 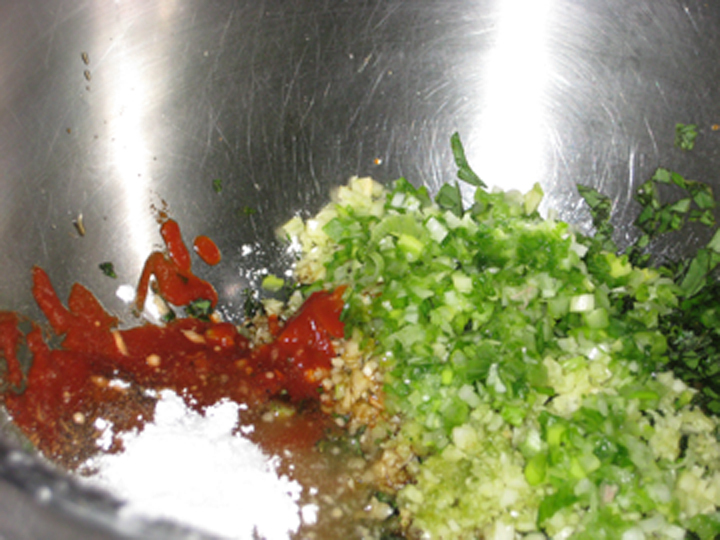 Mix all ingredients together in a bowl – being careful not to over blend. Form into meatballs – I made mine about 1 ½ Tbsp size (or 1.25 oz by weight) because that’s the size of small ice cream scoop I happen to have (a small ice cream scoop, incidentally, makes forming 35 meatballs a much less tedious endeavor). * If you’re using pork use: 4 cloves of garlic; 1 Tbsp fish sauce; 1 Tbsp hot chili sauce; 1 tsp black pepper; 1 tsp kosher salt; and omit the sesame oil. The other ingredient quantities remain the same. ** If you are cooking for someone with fish allergies, or don’t have fish sauce in your pantry and don’t feel like going out and buying a bottle, you can substitute a mixture of 2 parts soy sauce to 1 part lime juice. It’s not a perfect substitute, but it’ll get you somewhere in the vicinity of the flavor profile fish sauce adds to a recipe. ***You can also pan fry the meatballs in some sesame oil, or flatten them slightly and grill them like a hamburger/sausage patty. Baking them, however, is way easier. Stir together the rice vinegar, sugar, salt and sesame oil and whisk until the sugar dissolves. 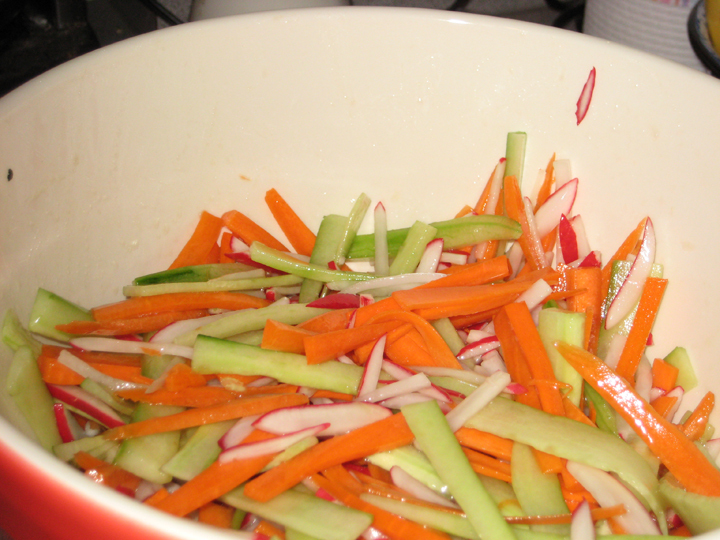 Add the julienned vegetables and let sit at room temperature for an hour. Drain vegetables before serving. 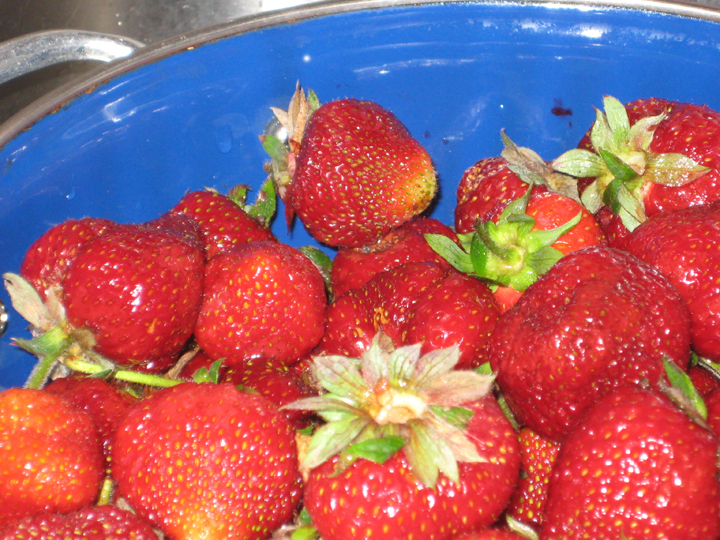 Do not make ahead – the vegetables will go mushy if you leave them overnight. Note: I made the brine and julienned my vegetables the night before and packed everything up in separate containers. On Tuesday night I dumped them all into a bowl, poured the pickling brine over them and let them marinate while I got on with the rest of dinner. Split rolls in half and pull out enough bread from the middle to form a ½” shell. Spread each side of the roll with some of the mayo. Add a layer of cilantro – or in my case, a layer of romaine lettuce. Arrange a layer of the pickled vegetables on one side of the roll. Top with some of the meatballs. Close sandwich. 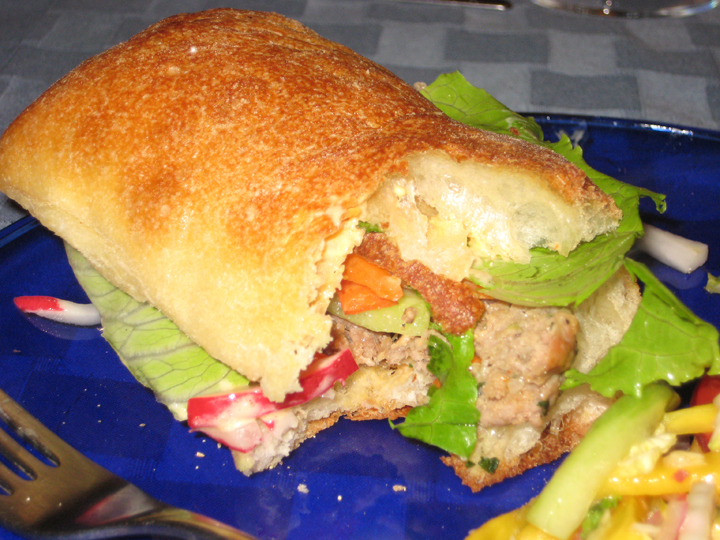 Note: The original recipe calls for layering sliced jalapenos on the sandwich as well. I thought there was quite enough spice going on without adding more, so I skipped that part. But, if you like more heat to your food add some thinly sliced jalapenos. I was going to make sweet potato chips to go with this for some crunch, but it’s been so damp here (and cold – cold and wet and I’ve brought blankets back out of my closet and had to pull out my long sleeve sweaters again. I am not pleased.) that nothing is getting crispy. 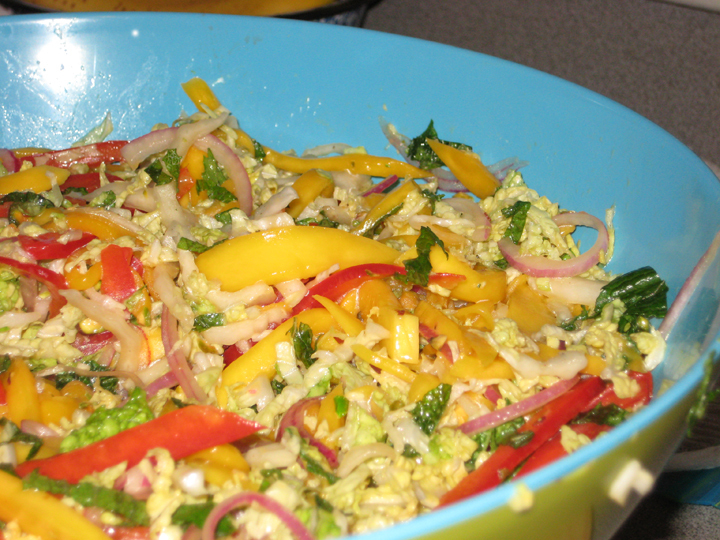 So, I went with a slaw instead, and this is pretty and colorful and crunchy and sweet. 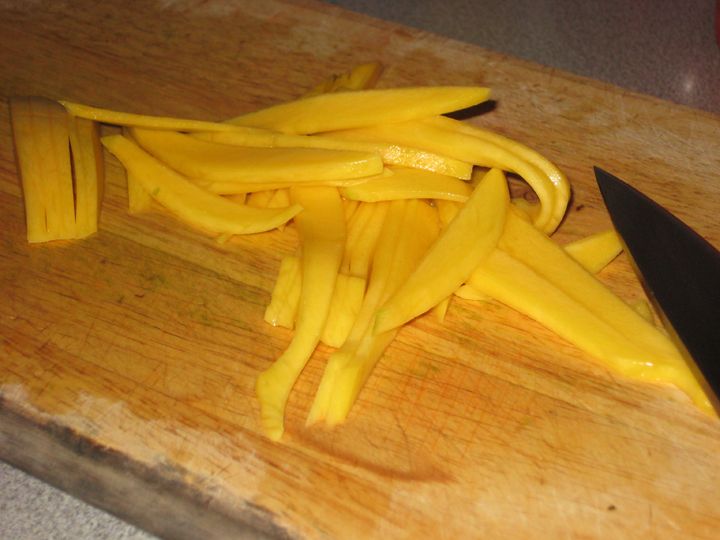 The really great thing about this is that you can use mango in whatever stage of ripeness you can find it. Mine happened to be fairly ripe, but I’d love to try it with greener mangos for more sour bite and crunch. I think you could probably also do this with firm ripe peaches in the summer. * The original recipe called for cashews which I couldn’t use because of a nut allergy. I thought the pistachios would add the same crunch and creamy nuttiness of a cashew without making one of my dinner guests ill. You could probably also use peanuts or pepitas.